In September 1979, the band played their first US concerts with Kenney Jones behind the drumkit. On 10 and 11 September, 1979, Pete Townshend, Roger Daltrey and John Entwistle got on stage in New Jersey, looked behind them and, for the first time ever in the States, they didn’t see Keith Moon. 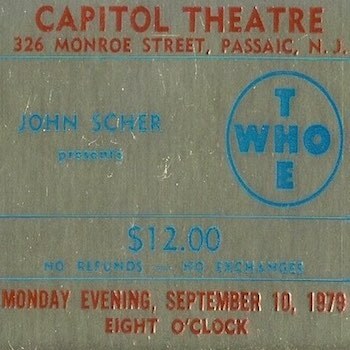 At the Capitol Theatre in Passaic, The Who played their first US concerts since Moon The Loon’s death the year before. The band’s beloved drummer had died in September 1978, from an overdose of the pills he was taking to combat alcoholism. The very next day, his bandmates vowed to continue, and were in production with the Quadrophenia movie before the end of the month. In January 1979, they announced former Faces drummer Kenney Jones as Keith’s replacement, and in May, he joined Pete, Roger and John on stage at the Rainbow in London. As Quadrophenia was released that summer, The Who played their biggest ever UK show, at Wembley Stadium. Then it was time to hit the road in the States for the Who Are You tour, which began in New Jersey, before five straight nights at Madison Square Garden in New York. Follow the official The Who Best Of playlist. 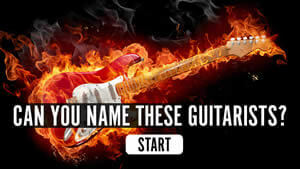 You’ve Got Rock ‘n’ Roll.’??? I don’t recall. For years I had a tape of one of those shows. It definitely had “All Right Now” and “A Trick of the Light” but I don’t remember a song called “You Got Rock And Roll,” unless someone was a little generous in assigning a title to some of the improvising they did. Bill and Erik, many thanks for your contributions to the post. We’re also unable to find any further references to ‘You’ve Got Rock ‘n’ Roll’ in Who history. We suspect, like you, Bill, that it may be a title that’s been assigned to a bit of an encore jam that night in Passaic! If anyone else has any information about the song, we’d love to hear it.